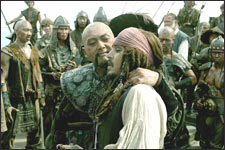 Pirates Of The Caribbean - At World's End (Telugu), a Telugu movie, is not currently screening in Hyderabad. In a classic case of too many twists ruining the tale, screenwriters Ted Elliot and Terry Rosario of the 3rd installment of what you thought was an unbeatable franchise, effectively convert what was expected to be a fun and screaming ride through scenes of piratical humor, maritime adventure and cheesy romance, into a bizarre adaptation of the Red Queen Statement - you must do all the brainwork and suffer the memory overload, even when the plot isn't moving forward an inch. fullhyd.com has 700,000+ monthly visits. Tell Hyderabad what you feel about Pirates Of The Caribbean - At World's End (Telugu), and then also see all user reviews for Pirates Of The Caribbean - At World's End (Telugu)!